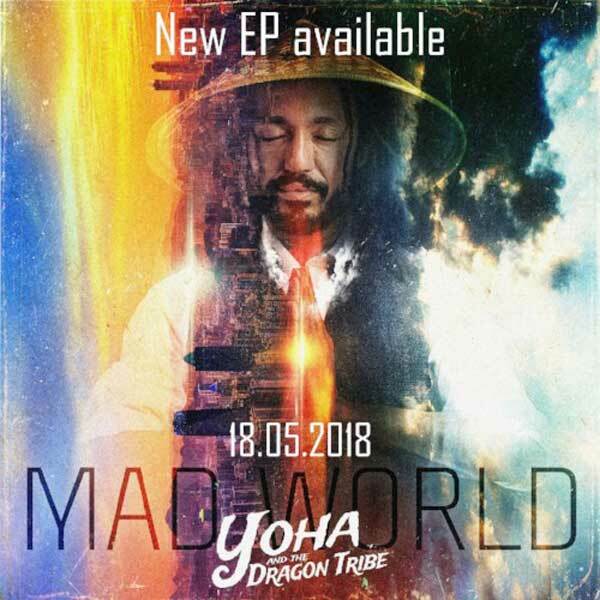 Brand new EP « MAD WORLD » by YOHA & DRAGON TRIBE Out on the 18th MAY 2018 on digital format & free download ! Yoha and the Dragon Tribe is a french reggae and world music band formed in 2017. Inspired by soul, blues, classical, indian music and more, Yoha and the dragon tribe is the fruit of an original and authentic mix diffusing an universal message. Yoha and The Dragon Tribe is presenting their second project MAD WORLD, afour-track EP. One year after their first album “The sound of my soul” was released, Yoha and the Dragon Tribe offers a more modern and elaborate production, starting with the song “Mad Word“. The latter is a well-arranged deep Dub Reggae tune, with a touch of Rock. Anissa – the main back vocal singer, brings a powerful Rnb and Hip-Hop part to this song. “I don’t care what you think” follows with a Ska Rocksteady, bluesy style, boosted by the brass section – which is new for the Dragon tribe and creates a very dynamic and positive track. Then comes “We live in a land“, the third track on the EP. Yoha played and sang this song himself. It is Soul music. The intro will take you to musical spheres with captivating melodies, simple, essential, refined but a deep message for the world and the need of spirituality. The 4th song “Mad world” – Special version it has nothing to do with reggae. Flying through the stars in a melodious and intimate piece just cello, piano and voices. It is with this song the Yoha and the dragon tribe reveals his true musical identity, full of harmony, emotions and for the general public. Clearly, Yoha and the dragon tribe is going to seek influences and inspirations far beyond reggae. Listen to the promomix of the EP “Mad World” on Soundcloud ! Jah9 Releases Love Has Found I New Reggae Artist, Jia She Ru Responds to the Problem of Crime in "What Can I Say"